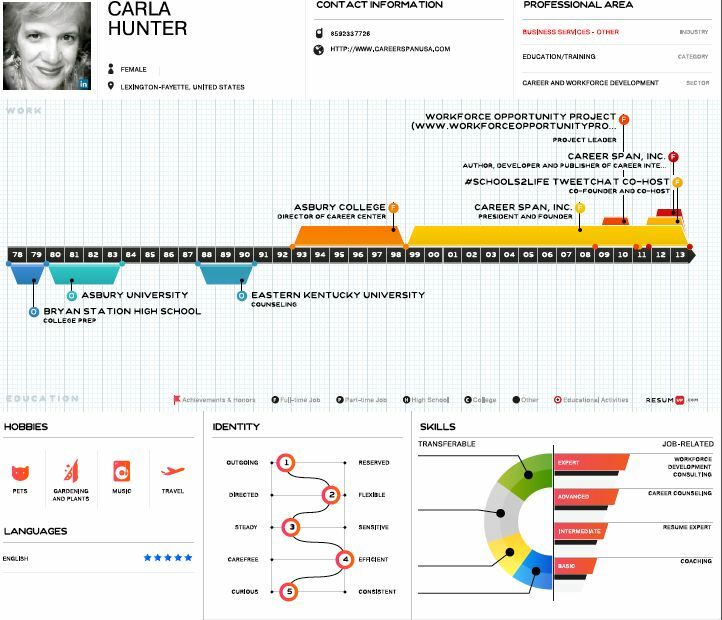 Infographic Resume: You Had Me At Hello!!!!! Successful resume writing is an art and science. The employer has an opening and looks for the right and best fit. Company culture, leadership and a gap in the current staff drives the need to grow the team. How does your resume and cover letter make the point that you deserve an interview? You likely will hear about this protected opening from a colleague and the world of work's interpersonal routing system delivers you an opportunity. Does your resume provide the necessary oxygen to sustain interest in meeting you? I could go on and on about the chemistry factor, but am focused today on an emerging resume art. Infographic resumes have increased over the past two years. What is very useful about them is how they take "data" and mine it into information that is quick to scan and an enjoyable diversion from the typical chronological resume. An infographic resume is a creative way to summarize your fit to the company's need. The science of success requires chemistry and the art of expressing yourself in innovative ways. Job Hunting: Do You Need a QR Code? In October 2012, the Bureau of Labor Statistics (BLS) reported that the US unemployment rate stood at 7.9 percent. Admittedly this is one of the lowest figures reported since 2009, yet it still amounts to a staggering 12.3 million unemployed persons. There is little wonder that competition for available jobs is fierce and job seekers are increasingly looking for ways to stand out from the crowd. The importance of social media in a comprehensive job hunting strategy is well documented. The Jobvite Social Recruiting Strategy reports that 92% of companies use or have plans to use social platforms for recruitment purposes, with 73% of companies having already made a successful hire. In turn, these statistics have educated job hunters into the importance of well thought out social profiles that are full of character as opposed to being unnaturally squeaky clean. The Jobvite Social Job Seeker Survey reports that 88% of job seekers have at least one social networking profile, while one in six respondents credited social media with their current job. With so many job seekers jumping on the social networking bandwagon, could it be time to find a new way to stand out from the crowd? One of the latest ways to appear different to the hundreds, if not thousands, of competing applicants that are standing in between the job seeker and the chance of a regular monthly paycheck is the use of a QR (Quick Response) Code. But wait, aren’t they something to do with couponing? Not any more. QR codes are increasingly commonplace on everything from fast food placements to movie posters. Users scan the code with their smartphone or tablet to be directed to (hopefully useful and mobile friendly) content. Savvy job seekers are looking at how they can use a QR code on their resume or business card as part of their job hunting strategy, and some, like Victor Petit, are doing it in a very creative manner. There’s no denying the appeal of the QR code to help an applicant differentiate themselves from other applicants, but does that mean that every job seeker should have one? That largely depends on the sort of company a job seeker is hoping to work for. Progressive employers such as advertising agencies, marketing firms, and software technology companies are likely to find the use of QR codes attractive. To see that a candidate has enough understanding of the technology to be able to implement it in their job search will be an attractive quality to many employers. It’s a given that a resume and covering letter should be tailored as far as possible to each job application, so one way a job seeker can gauge whether or not to include their QR code in a particular application is to see if the company they are applying to uses the technology themselves. If they do, it’s fairly likely that the job seekers personal QR code will be well received. Sold on the idea of a personal QR code? The one question that remains is how job seekers can get their hands on one. Corey Eridon shows how to create a QR code over at HubSpot.